Now that my sunburn is healing, and I’m mentally and physically recovered from last weekend’s race, I’ve gained enough distance to reflect upon the experience. 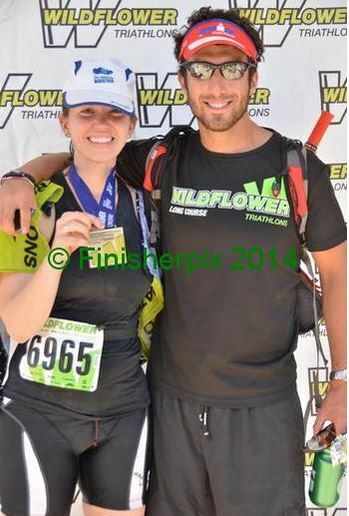 Wildflower was brutal: I chose maybe the most difficult course on which to test my first real triathlon training plan. There are things I would’ve done differently (get in the water earlier, ensure the wetsuit zips, wear more sunscreen) and aspects of my training I would have expanded upon (bike more hills, do more (or any) bricks, dabble in open water swimming), but overall, I’m happy with how the day went. While I’m not 100% convinced that I can handle Vineman in July, I’m ready to start training again and see where it takes me. Keep up the hard work and training! sounds like you had a blast, it is on my schedule for 2015. would you do the race again? that’s a good question. probably not, but i wouldn’t be surprised if i do race wildflower again. Stsy strong! No matter how many tris we do every race we learn more! You always have such a great mind set about all of this. Good for you. I am certain you will be great because of all of this awesome prep both mentally and physically! You’re awesome girl! I still am yet to break through my fears & sign up for a triathlon! It is a little scary, I admit! You can do it though! Go get it! All in! It’s all a learning experience, just keep training hard and you will be ready in July! Getting some distance is definitely good for perspective. Good luck with your training, and don’t feel forced to do something you don’t really want to.. I just pondered training for a triathlon today… Then I came to my senses. 🙂 I am in awe at just the training that goes into it, let alone the race itself. You deserve a congrats for all you’ve done, and all you will do. Congrats!!! YOU CAN DO IT!!! XOXO!!! Great reflections!! Don’t doubt yourself- you can do it! !